La Pavoni 2 Group Espresso Machine M SeriesCommercial coffee-machine perfect for any size of bar, restaurant, coffee shop or cafe's. La Pavoni are the best commercial coffee makers and espresso machines, ideal for preparing fantastic tasting hot cappuccino, espresso and lattesMilan, 1905. In a small workshop in Via Parini, the engineer Mr Desiderio Pavoni was working on the project of what was to become the first bar coffee machine.Now more than 110 years later, their dedication and hard work has turned La Pavoni in one of the industry leaders known worldwide for their award-winning and perfectly engineered espresso machines. The Bar M 2 Group features: Semi-automatic, continuous brewing espresso coffee machine with push button, power indicator light and electro valve. Press-forged nickel brass groups with vertical infusion chamber and pressurisation system.Colours: Ruby Red, Metal Grey, Black on choice, free of charge.For stainless-steel body with abs side panels an extra charge will be applied. Groups made with press-forged brass and chrome plated, with vertical infusion chamber and pressurisation system.· Boiler in copper equipped with transversal heat exchangers and front· injectors for each group· Independent radiator hydraulic system for every group· Manual boiler water charge button· Anti-vacuum valve.· Double scale gauge for pump and boiler pressure control.· Pre–infusion function.· Mixed hot water endowment.· Water level control with sight glass.· One flexible steam jet.· One hot water tap with flexible jet.· Telescopic handles for the machine carriage.· Electrical heating up with safety thermostat.· Electro pump: internal included. · Voltage: V. 230 – V. 230/3 – V. 400/3N (50/60 Hz. ).· Heating element - Resistance - 2 g 4370 W.· Width: L mm - depth: P mm - height: A mm 780 x 555 x 530 If living in a hard water area, a water filter is recommended. ..
La Pavoni 2 Group Espresso Machine S SeriesCommercial coffee-machine perfect for any size of bar, restaurant, coffee shop or cafe's. La Pavoni are the best commercial coffee makers and espresso machines, ideal for preparing fantastic tasting hot cappuccino, espresso and lattesMilan, 1905. In a small workshop in Via Parini, the engineer Mr Desiderio Pavoni was working on the project of what was to become the first bar coffee machine.Now more than 110 years later, their dedication and hard work has turned La Pavoni in one of the industry leaders known worldwide for their award-winning and perfectly engineered espresso machines.The Bar S2 Group features: Semiautomatic continuous brewing espresso coffee machine, controlled by means of a lever and microswitch. Press-forged chromed brass groups with valves infusion chamber.Colours: Ruby Red, Metal Grey, Black on choice, free of charge.For stainless-steel body with abs side panels an extra charge will be applied. · Press forged chromed brass groups with valves infusion chamber.· Boiler in copper equipped with transversal heat exchangers and front· injectors for each group· Independent radiator hydraulic system for every group· Manual boiler water charge button· Manometer for the boiler pressure control.· Anti-vacuum valve.· Water level control with sight glass.· One flexible steam jet.· One hot water tap with flexible jet.· Telescopic handles for the machine carriage.· Electrical heating up with safety thermostat.· Electro pump: internal included.· Voltage: V. 230 – V. 230/3 – V. 400/3N (50/60 Hz. ).· Heating element - Resistance - 2 g 4370 W.· Width: L mm - depth: P mm - height: A mm 780 x 555 x 530. If living in a hard water area, a water softener is recommended! ..
La Pavoni Lever 2 Group Espresso Machine L SeriesCommercial coffee-machine perfect for any size of bar, restaurant, coffee shop or cafe's. La Pavoni are the best commercial coffee makers and espresso machines, ideal for preparing fantastic tasting hot cappuccino, espresso and lattes Milan, 1905. In a small workshop in Via Parini, the engineer Mr Desiderio Pavoni was working on the project of what was to become the first bar coffee machine. Now more than 110 years later, their dedication and hard work has turned La Pavoni in one of the industry leaders known worldwide for their award-winning and perfectly engineered espresso machines. The Bar L2 Group features: Lever espresso coffee machine with chromed brass groups. With mechanical movement. Thanks to a special device which lets the hot water only into the group, keeps the brewing pressure always at the same level for a better exploitation of the coffee. Colours: Ruby Red, Metal Grey, Black on choice, free of charge. For stainless-steel body with abs side panels an extra charge will be applied. · Chromed brass group with mechanical movement · Manual boiler water charge button · Anti-vacuum valve. · Water level control with sight glass. · One flexible steam jet. · One hot water tap with flexible jet. · Telescopic handles for the machine carriage. · Electrical heating up with safety thermostat. · Voltage: V. 230 – V. 230/3 – V. 400/3N (50/60 Hz.). · Heating element - Resistance - 2 g 4370 W. Width: L mm - depth: P mm - height: A mm 780 x 555 x 530 If living in a hard water area, a water softener is recommended! ..
La Pavoni 2 Group Espresso Machine V SeriesCommercial coffee-machine perfect for any size of bar, restaurant, coffee shop or cafe's. La Pavoni are the best commercial coffee makers and espresso machines, ideal for preparing fantastic tasting hot cappuccino, espresso and lattesMilan, 1905. In a small workshop in Via Parini, the engineer Mr Desiderio Pavoni was working on the project of what was to become the first bar coffee machine. Now more than 110 years later, their dedication and hard work has turned La Pavoni in one of the industry leaders known worldwide for their award-winning and perfectly engineered espresso machines.The Bar V 2 Group features: Electronic programmable dosing espresso machine with digital control pad and microprocessor. Four cup size selections including continuous brewing and a stop button. Hot water jet controlled by a push-button with automatic release; electrical cups-warmer. Press-forged nickelled brass groups with vertical infusion chamber and pressurisation system. Colours: Ruby Red, Grey, Black on choice free of charge. 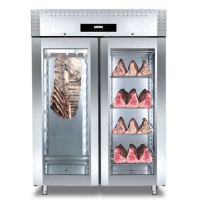 For stainless-steel body with abs side panels an extra charge will be applied.· Groups made with press-forged brass and chrome plated, with vertical infusion· chamber and pressurisation system. · Boiler in copper equipped with transversal heat exchangers and front injectors for each group. · Independent radiator hydraulic system for every group.· Manual boiler water charge button. · Anti-vacuum valve.· Double scale gauge for pump and boiler pressure control. · Pre–infusion function. Mixed hot water endowment. · Electronic automatic water level.· Water level control with sight glass. One flexible steam jet.· One hot water tap with flexible jet. · Telescopic handles for the machine carriage· Electro pump: internal included.· Voltage: V. 230 – V. 230/3 – V. 400/3N (50/60 Hz. ).· Heating element: 2 g 4370 W. · Width: L mm - depth: P mm - height: A mm 780 x 555 x 530 If living in a hard water area, a water filter is recommended. ..
La Pavoni 2 Group Espresso Machine D SeriesCommercial coffee-machine perfect for any size of bar, restaurant, coffee shop or cafe's. La Pavoni are the best commercial coffee makers and espresso machines, ideal for preparing fantastic tasting hot cappuccino, espresso and lattesMilan, 1905. In a small workshop in Via Parini, the engineer Mr Desiderio Pavoni was working on the project of what was to become the first bar coffee machine. Now more than 110 years later, their dedication and hard work has turned La Pavoni in one of the industry leaders known worldwide for their award-winning and perfectly engineered espresso machines.The Bar D 2 Group features: Semiautomatic continuous brewing espresso coffee machine, controlled by means of a lever and microswitch. Press-forged chromed brass groups with valves infusion chamber.Colours: Ruby Red, Metal Grey, Black on choice, free of charge. · Groups made with press-forged brass and chrome plated, with vertical infusion· chamber and pressurisation system.· Boiler in copper equipped with transversal heat exchangers and front injectors for each group.· Functions display and distribution counters.· Independent electrical cups warmer with warning light.· Independent radiator hydraulic system for every group.· Manual boiler water charge button.· Anti-vacuum valve.· Double scale gauge for pump and boiler pressure control.· Pre–infusion function. Mixed hot water endowment.· Electronic automatic water level.· Water level control with sight glass.· Two flexible steam jets.· One hot water tap with flexible jet.· Telescopic handles for the machine carriage· Electro pump: internal included.· Voltage: V. 230 – V. 230/3 – V. 400/3N (50/60 Hz. ).· Heating element: 2 g 4370 W. · Width: L mm - depth: P mm - height: A mm 780 x 555 x 530 If living in a hard water area, a water filter is recommended. ..